Magnificent Valedictory Function Brings AEG ASB 7th Annual Sports Meet, ATHLEEMA 2019 to a Fitting Close! 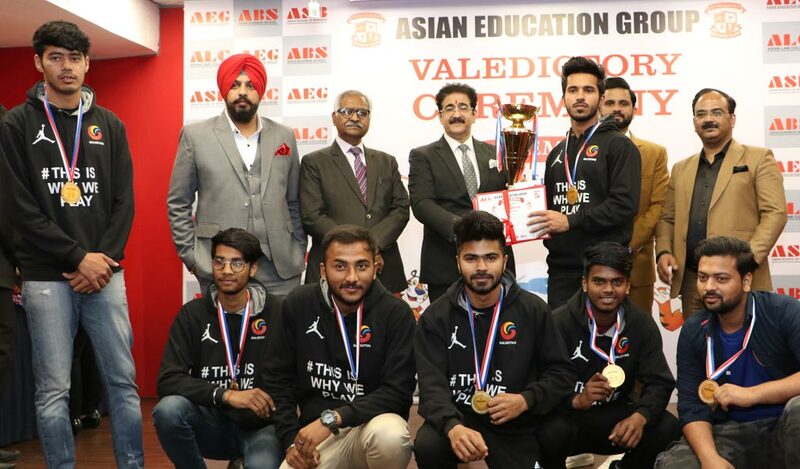 Asian School of Business / News & Events / Campus Updates / Magnificent Valedictory Function Brings AEG ASB 7th Annual Sports Meet, ATHLEEMA 2019 to a Fitting Close! Asian Education Group (AEG) recently conducted its mega annual inter-college sports event – ATHLEEMA 2019-Season 7 – between 13th to 15thMarch 2019 at the sprawling Jasola SportsComplex, New Delhi with its famous punch of excitement and grandeur! 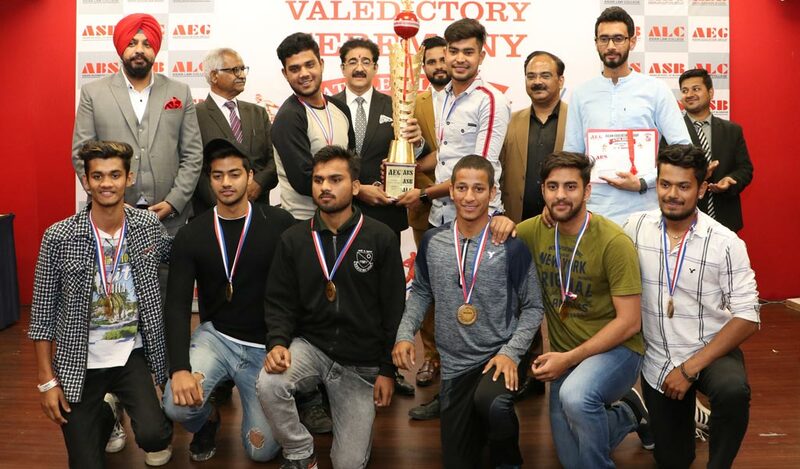 After two days of intense competitions at Jasola Sports Complex on 13th & 14th March 2109, a magnificent ‘Valedictory’ function for ATHLEEMA-Season 7 was held on Friday, 15th March 2019at the AEG campus in Noida to felicitate students for their exemplary performance and zealous participation at the games. The auditorium was jam-packed with winners and participants from 36 colleges and universities – including Asian School of Business (ASB) and the other two constituent group colleges of Asian Education Group, namely Asian Business School (ABS) & Asian Law College (ALC) – waiting for their moment of glory receiving their trophies and medals from none other than the magnate of Indian television and films, Dr. Sandeep Marwah! The valedictory ceremony began with the warm welcoming of the AEG President, Dr. Sandeep Marwah and AEG Directors, Dr. Lalitya Vir Srivastava, Mr. Saurabh Sharma & Mr. Gurdeep Singh Raina, as well as Director of Asian Law College, Dr. Salim Akhtar. AEG Directors expressed their delight at the wholehearted and joyous participation of students for the various events over the preceding two days, i.e. 13th & 14th of March 2019 at the Jasola Sports Complex. AEG President, Dr. Sandeep Marwah complimented and applauded the winners and, conveyed that he was himself tempted by the beautiful shining trophies! He further encouraged students to take sports seriously as it was sincerely being recognized as an important aspect of attaining success and a wonderful personality! This was followed by the result declaration for which event coordinators were invited on stage to announce winners in their respective categories. A very special award was initiated this year to galvanize students from across all AEG schools, i.e., ASB, ABS and ALC into adopting sports earnestly, namely, “The Sportsperson of the Year” for both boys and girls separately. This coveted award carried the prestige of being given to a student who was exceptionally active in all quarters of events and activities throughout the year and worked towards team building and motivation. The valedictory function came to a close with the customary ‘Vote of Thanks’ delivered by Mr. Ravi Sharma, Dean-Corporate Resource Cell, Asian Education Group.